Pet surgery can be a scary thing for dogs and owners alike. #1. Make a comfortable place on the floor for your dog. Your dog is likely to be clumsy and a bit out of it until the anesthesia has worn off all the way. This can make them more prone to fall off of the bed or the couch, which could end up ripping their stitches. That’s why it’s best to help them to stay comfortable on the floor. #2. Keep your other pets and kids away from your dog. 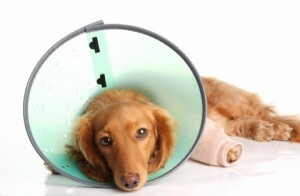 It’s not uncommon for a dog who is normally sweet to bite or snap at other pets or kids while they are recovering from surgery. If this is the case for your dog, know that the symptoms are temporary, and you’ll get your sweet pup back in no time! #3. Take your dog outside on a leash. Even if your dog is used to coming and going as they please, it’s important to walk them on a leash when they need to go out. This prevents them from running or jumping during recovery, and it’ll help you to be the first to know if there is a problem with their bowel movements. Learn more tips for helping your dog recover from surgery when you stay tuned for our next blog.